This wee building was once Frank and Hope Miller’s grocery store. In 1967 it became an art gallery. Operated by Pauline and Jim Yearbury until 1976, it was on the corner of York and Chapel Streets, where the Duke Tavern car park is now. A year later Pauline painted these two faces, peeping in at her as she worked, through one of the split pane windows. 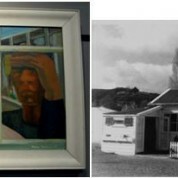 In oil on board, it joins art works by thirteen other local artists in Russell Museum’s newest exhibition – Made in Russell.